credits: The information presented here is based upon the author's own experience and research of the past 50 years including personal interviews with Gene Mosher, last owner of The Kelsey Company and heavily influenced and supplemented by the previously published work of Elizabeth Harris, Stephen O. Saxe and by Glover Snow, second owner of Kelsey Co. According to Elizabeth Harris' "Personal Impressions" catalog of historical presses, the Victor was designed and manufactured - or at least sold by - James Cook of Meriden, CT. The image below of Cook's catalog of 1887 - from the Stephen O.Saxe collection - also documents this history. William Kelsey acquired the rights to this press and eventually listed in their catalog in 1890. Kelsey apparently cast one new part - a replacement side arm with the "Kelsey & Co. Meridan, CT" cast into it to replace the original which simply pronounced "Victor". (image below). This Victor press appears in Kelsey's 1934 catalog. We don't yet know when Kelsey ceased production and sales of this model Victor, but when they did, they replaced the front handle of the Excelsior with a side lever and sold it as their "Victor" press in 5x8 and 6x10 sizes for many years. So, this "Cooks Victor" was not the press which later became the Kelsey Victor, available in 5x8 or 6x10 sizes. The 6x9 Cook's/Kelsey Victor was eventually discontinued, a loss to printers everywhere. Later Kelsey "Victor" models were simply Excelsiors with a side-lever fitted to replace the front handle for impression. The later Kelsey "Victor" models share 95% of the same parts and design as the standard Kelsey Excelsior and both presses print much the same. In fact, the only difference is the handle and some mounting hardware. However the 6x10 Model Q (circa 1953) & Model V (circa 1958) did benefit from the Cooks design. 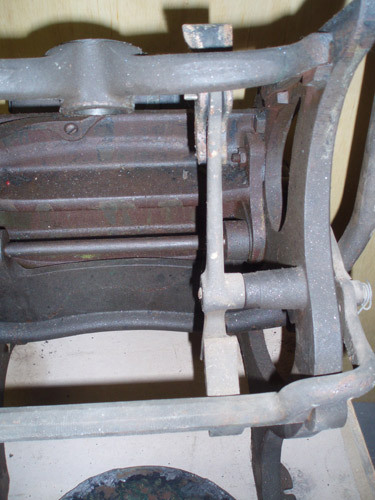 They use a similar roller assembly to the one found on the Cooks Victor. In fact, on one style, the parts seem to be almost interchangeable. Another version shows an add-on to the standard roller hook assembly - which removes both hooks and springs and replaces them with a similar single-spring/elbow, t-head system to achieve the same benefits of the original design. These systems uses a single toggle "T" head connected to a two-piece "elbow" assembly, using one single spring to apply tension. (photos to come) This system is far superior to the two-hook, two-spring system seen on most Kelsey presses. A press with this setup will operate more smoothly due to the fact that the rollers react better to the transition up the rails and onto the ink disk. 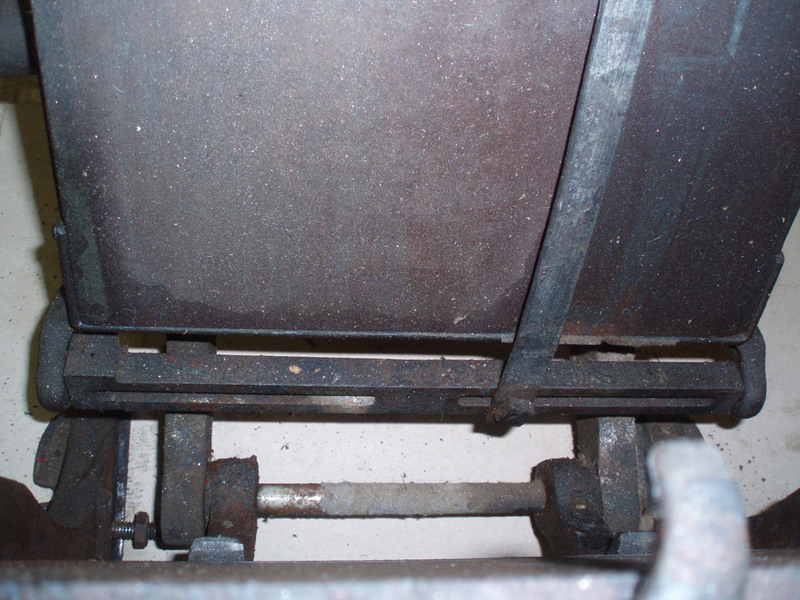 This angle change is so sharp that the two-spring hook system bogs down at this point and the operator is forced to apply a lot more pressure to get the rollers "over the hump" and up on to the ink disk. By using the one-spring elbow system, energy is dissipated in a different way, making it easier to operate the press. This system is much smoother than the common hooks system, and is nearly the same as the advanced (C&P-style) system used only on the Model X 6x10 - the last press made by Kelsey Co. The Cooks/Kelsey Victor, is a very robust, thoughtfully engineered press with greater impression strength than the Excelsior and is a very well-assembled press. It is also quite easy to disassemble for restoration or repair. 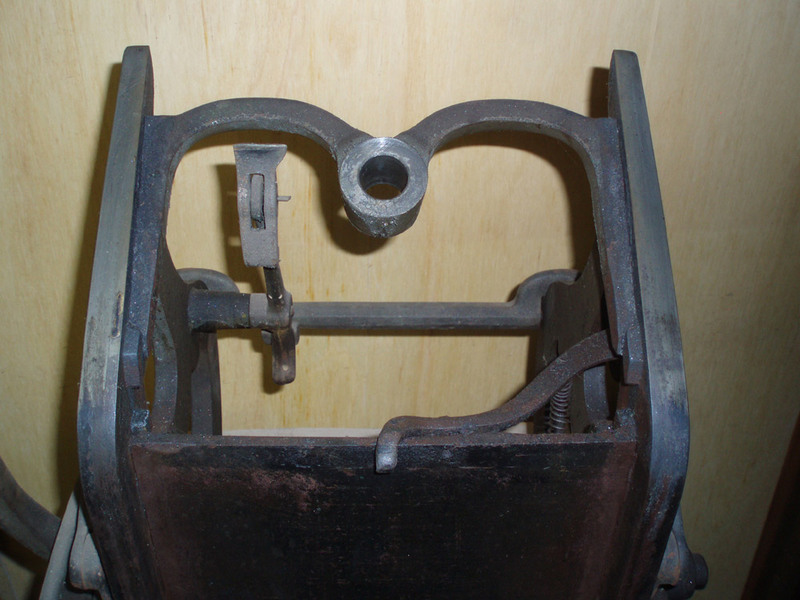 A study of the engineering, design and manufacturing techniques employed clearly indicate that these presses were designed and manufactured by two very different press builders - possibly also cast at two different foundries. Although not terribly common, these do turn up now and then and printers love them. We acquired our first at auction for $35 in 1980 (the price of a new one in 1887), received another in 2014 (now worth $1200) and recently acquired yet another in 2015 - which will be restored and will sell for $2500, possibly more. Still more of these presses continue to surface across the country and over the years, we have restored a half-dozen or so, and have recently acquired another which is currently in the shop awaiting restoration in 2017. This is a very robust and capable table-top press, with capacity and strength - by design - quite similar to the popular Chandler & Price Pilot Press. (also known as the Thorpe Pilot) We continue to maintain one Kelsey Cooks-Victor in our permanent collection. It is available both for demonstration and printing as well to serve as a full set of "master" parts that can be used as patterns and guide to allow our restoration work shop to reproduce any part on this press. 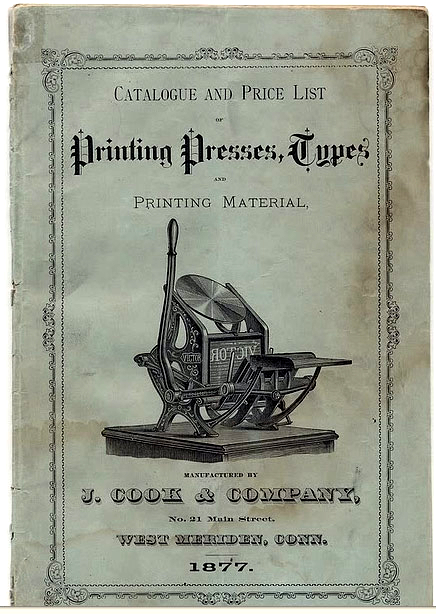 We have only seen two different models of presses made by Cook, although their catalog lists quite few more - including presses made by other manufacturers. The first Cook press we came upon is the Victor model as seen to on these pages, the other is the extremely rare Enterprise 3x5 self-inker - similar in many ways to a Craftsman 3x5 and other 3x5s of its era. And, stamped on the side is the name "Meridan, CT." Same guy; same place... but not Kelsey. According to history, William Kelsey rented space in Mr. Cook's building in West Meriden and later bought rights to his presses. But we've only seen one of these 3x5s in 50 years of study... This press is operational - with a recently fabricated ink disk - and resides at the Holcomb-Jimson Museum in Lambertville, NJ. 1) The first "Victor" we know of is the 6x9 Victor made by Cook in Meriden, CT until they were bought out by Kelsey about 1890. 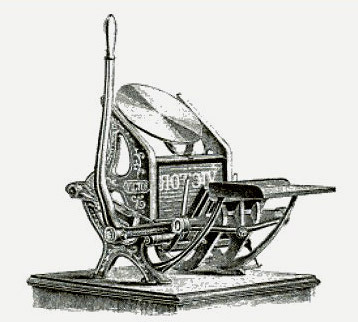 2) There was also a press company named "Victor" in Boston, but their presses were made in other sizes: 4x6, 5x8, etc. These are rare. 3) Craftsman Machinery also made a copy of the "Victor" press - which they named the "Victory" model, but that is just a copy of the 4x6 Victor Press Company press. 4) And then, after Kelsey Co bought out Cook, Kelsey Co. sold Cook's press as their 6x9 "Victor" and only changed one part - the side arm that they had cast with their name on it. 5) And once Kelsey ran out of Cook's parts, they simply added a side-lever to their 5x8 & 6x10 Excelsior models and called them "Victor". These image files are large and may take some time to load. This was very, very interesting to discover. 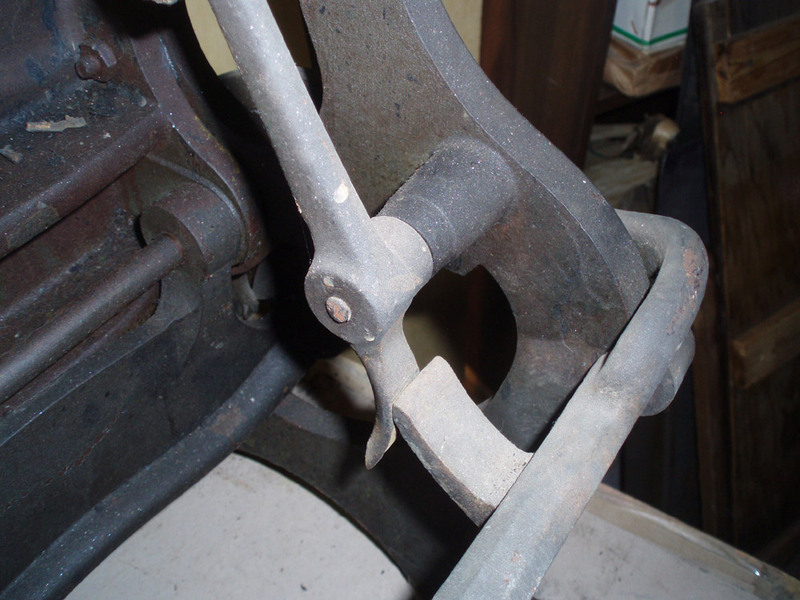 As I was working on this Victor today, I could not figure out just how Cook expected this spring to work to both pull the grippers tight against the platen to draw the printed sheet off of the type form, and then open the grippers back up so that the operator could remove the printed sheet. There is simply no mechanism to open the grippers up again as on just about every other platen press I have ever worked on. 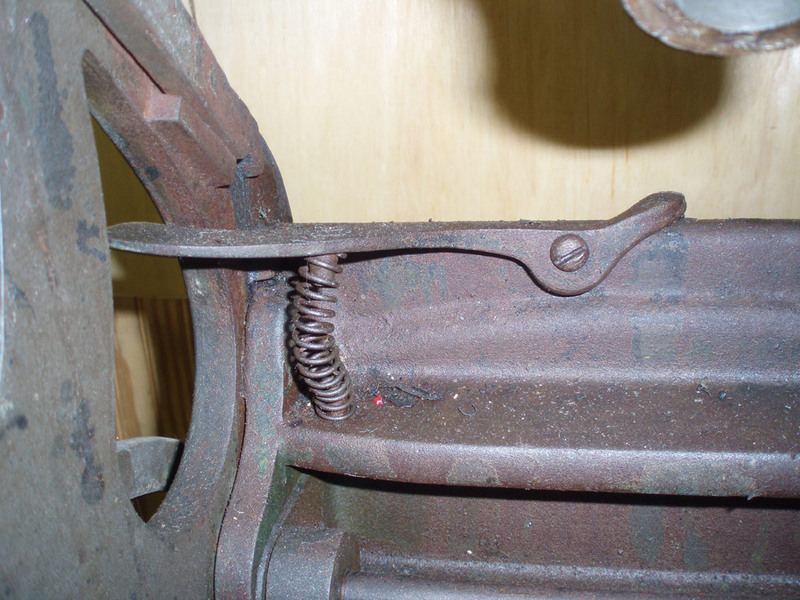 But, after sitting and staring at the mechanism over a period of hours yesterday, I came up with the conclusion that the spring had to both pull AND push the gripper bar into the appropriate position based upon whether the platen was opening or closing. The only way I could see to do this was to cut a spring to a custom length so that it remained tight throughout its motion and actually push the lever back into position to open the grippers. It worked. And it works well. It's very nearly balanced, so it doesn't require much effort at all to open the grippers. It worked! My theory is proven and the mechanism works perfectly now.